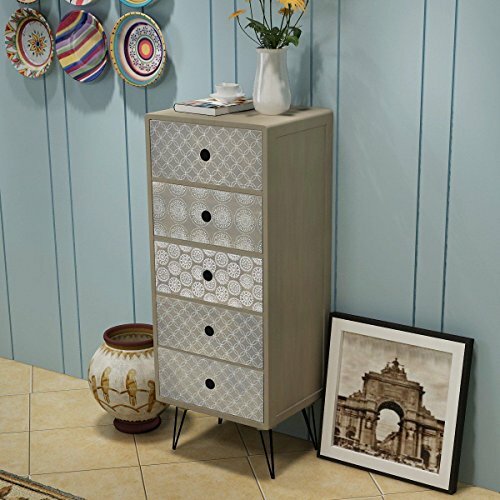 This side cabinet with 5 drawers has a retro design with elegant decorative patterns. The sideboard will make a practical as well as highly decorative addition to your bedroom, living area or lounge room. The rectangular top is ideal for placing a telephone or display decorative objects such as photo frames or potted plants. The five drawers provide ample space for keeping all kinds of smaller items organized and within reach. Thanks to the high-quality MDF material and the strong metal pin legs, this commode is very sturdy and durable. Assembly is really easy. View More In Storage Drawer Units. If you have any questions about this product by HomeSweet, contact us by completing and submitting the form below. If you are looking for a specif part number, please include it with your message.